What is the Potential Impact of the iPad, Kindle, and other Tablet Computers in Education? In this month’s Educational Technology Debate, we’ll hear from experts in education and technology on the promise and pitfalls of tablet devices in the developing world. We’ll also welcome participation with Slide2Learn – a conference on iOS device usage in education, April 18-19 in Queensland, Australia. Please join us by subscribing to our posts and commenting on each with your thoughts, opinions and insights on using this new ICT in education. Written by Wayan Vota on April 5, 2011 in Tablet Computers in Education. In Kenya (East Africa) we observe similar challenges. Currently there are a hundred XO (OLPC) systems in a Primary School of four hundred students. The teaching is British style where at the end of Standard eight the students sit for the nationwide examination. A technical challenge is getting internet access for XO server, available and quite expensive. In addition to the primary school, the Educational Centre also has a vocational (polytech) school as well as computer-based secretarial college. We have been with XO systems, six in the summer of 2008 replace by a hundred in the summer of 2009. We intend to return for a couple of weeks in summer of 2011 (very soon). We would like to be able to implement eReader functionality with the existing hundred XO (OLPC) systems this time around. To my knowledge we have no support from the Education ministry in Kenya. This is a non-profit church-related partnership of more than two decades. Electricity came after our 1996 summer work camp. Good observation;getting internet connectivity to schools is still very expensive, however there are several products tailored to meet the requirements of public schools from the mobile service providers at an affordable cost. I also wish to point out that the Ministry of Education in Kenya does support the introduction of ICT to schools by NGOs as long as the whole process is clearly validated. KIE (Kenya Institute of Education) is one such arm of the MOE that has been trying very hard to design digital content that is in line with the curriculum offered. I am a teacher, currently doing a research on the use of ICT in public schools in kenya and comparing the same with the schools in Japan. I appreciate your effort in supporting the education system in the country. "From my experience in developing countries (Uganda and South Africa) it is the lack of technical support, teacher training and culturally specific learning materials that are critical factors in the scaleability and sustainability of using ICTs in these countries ( which could also be said for developed countries too) "
Exactly so. That is why the OLPC XO is designed to be serviced by children, and why we need to produce OERs for technical training on electricity and Internet systems, and teacher training on how to use computers + OERs, in addition to student-level OERs on all school subjects, and whatever else turns out to be needed. Not only are OLPC XOs untethered, they link together using a hardware mesh network and collaborative software, so that students can work on homework projects together while in their respective homes, or under trees in different parts of the village or town. I obviously believe that the tablet form factor offers a lot of potential impact especially if it's more affordable and can enable even more students, educators and communities to gain access to information and to the many learning resources available online and growing by the day (Khan Academy). If one views the tablet as a thin-client device then its full realized potential is almost entirely dependent upon the quality of the network and its availability to users. You could be living in a very remote area, drop a working car into my community but without a road or a highway, I won't get very far. I still need fuel, roads and a map to make the journey from one community to the next. Maybe Cisco, the World Bank and Google will join forces to help build out global network highways in areas that have little or no reliable power or internet access. Then we'll see the potential impact a lot sooner. That's one possible future. Your car analogy does not work. A tablet computer in a village has enormous value even if the only way to get data in and out is by CD, DVD, and flash drive, aka SneakerNet. The data rate of a person walking or bicycling from one village to another with a 4.7G DVD in, say, eight hours, is 4.7G/8*3600 sec, or 163 KB/sec. A hundred tablet computers in a village, forming a mesh network and sharing the one DVD drive on the server, are more than 100 times more powerful, according to the well-known network effect. I think the current crop of powerful, color, tablets are not yet there. considering teacher who live in a poor country which is low salary. Who is gonna provide this iPad, Kindle, and similar eReaders and touchscreen devices to them? Is there any organization who care about them? 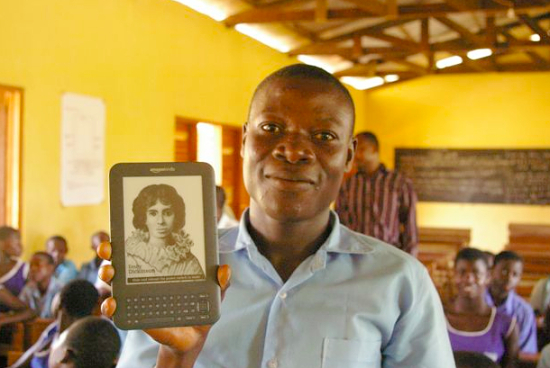 As the price of eReaders and other tablets drop below $100 each, why should we worry about who will by them for the developing world? I think parents will start to buy them for their children as a learning tool. Yes, rich parents will be the first, but that's the same in every country/culture. The rate of diffusion is what we should focus on. In this case, I still think parents will find a way to pay if they believe its a true educational advantage. to provide Open Education Resources (OERs) at no cost for all subjects at all ages in all required languages. Both Free Software and OERs commonly come with the Software Freedoms, including access to source code, and the rights to make and distribute modifications under the same or similar license. The long-term payback is estimated at about $200 trillion in increased global GDP annually when poverty is eliminated, and the world reaches parity with Europe and the USA. (Yes, American trillion with a T, 1 and 12 zeroes. In programmers' notation, that number is 2e14.) I leave it to others to work out the Net Present Value and Return on Investment implied by such numbers. In addition to economic growth, there will also be the elimination of the ills associated with poverty, such as health problems, early death, oppression, government corruption, and so on. That is almost a quadrupling of global economic activity. At a steady growth rate of 5% annually in all developing countries, if all were brought into the program, it would take 28 years. We have strong hopes of achieving a higher growth rate when every child graduates from school ready for a job, but that remains to be seen. UNRWA placed XO-1 laptops in Palestinian refugee camps in Lebanon and Gaza last year, and has announced plans to supply them to all Palestinian refugee camps in whatever country. Of course, success of this mission depends on other factors such as political will, whether a country wants this kind of help (North Korea doesn't so far), and conditions on the ground, particularly where there is war and the like. We do not have a date for the XO-3. However, we have just learned that Sugar Labs has hired C. Scott Ananian, a developer and manager of the highest quality, to manage hardware and software design for this next product. Interesting calculation. Does the $25 bn annually cover anything beyond the $75 tablet for each student? To equate the provision of an eReader or equipped tablet with the provision of "an education" seems a rather long and dangerous extrapolation. In addition to a new computer every four years for students, it includes renewable electricity generation and Internet connections. I am assuming that OERs need to be written once and can then be updated by teachers and students. Teacher training programs exist, needing only translation and relatively minor modifications for other countries. I left out the costs for building enough schools and hiring enough teachers, which I don't have adequate data to estimate. What else would you like to see added in? Of course, this $25 billion annually is just a floor, to be compared with the savings from replacing textbooks. That makes the minimum practical investment negative for many countries, and the ROI infinite. When children graduate, get jobs, and pay taxes, countries can consider spending more on education, in a virtuous circle. It makes sense to me that the cost of eReaders / equipped tablets will be lower than textbook costs, and continue to fall, but I am not convinced that it would be the best resource allocation decision for many countries. The teacher-training programs in developing countries I have witnessed and worked with are, in my experience, very costly and often only minimally effective at best. A large part of this relates to the constraints of cost that lead to mid-career trainings on new technologies / techniques that are a week or shorter in length. If you have details and budgets for trainings that have proven cost effective and feasible, I would love to see them. I would say then that when looking at the SROI, I would want to examine each particular MoE's options for resource allocation. If teacher quality is particularly low, I don't see that eReaders or similar interventions would be the most effective investment. I think you would ensure a more sustained impact (and also SROI) through an increased focus on teacher quality in many countries (see education economists Levin, Hanushek and Carnoy), prior to a saturating the system with eReaders. I also think it would be a dangerous assumption to expect teachers and students to "update the OERs", as you say. In sum I would ask; what is the added benefit of 10,000 new e-texts over 10 old textbooks if reading comprehension and critical thinking are absent in the classroom? But again, if you have the fine details on the teacher training accompanying the calculation you present, I would love to see it. I am sure this could work in some places, but for many of the least developed I think it would be a gross misuse of funds. How encouraging to see this topic discussed and solutions found! Okay, just one man's experience from inland Liberia, but internet access, low cost tablet computers, and sneakernet delivery of high volume content (video lectures, encyclopedias, etc) are a pretty good fit. Form factor of tablets ALMOST where we need it, but electricity consumption must be very very low and cost must drop below $100. Lots to be said for electronic ink. This paradigm (internet / electronic based instruction) may be incompatible with integration of existing teacher corps in some areas. Are efforts being made to develop instructional techniques which utilize teachers in more of a facilitator role and leave most of the real instruction to 'distance learning' or computer assisted techniques? Beware of the school where the teacher is nothing more than a 'facilitator'. The real power in education is in forming positive relationships and fostering student growth. Whatever devices you choose, the learning (and the student) must come first. If you want a facilitator, why pay a teacher? The short answer to your question is Yes, people are working on everything you asked for. Would you care to join in the work? The OLPC XO idles at about 0.5 Watt when being used as an e-book reader. Its maximum power consumption is about 8 W. The next generation XO-3 will be even lower in power consumption. Several NGOs are designing solar power installations for schools. We need to scale up those project to national and global levels. We know that with proper training teachers can learn to understand, appreciate, and use modern teaching techniques. The biggest obstacle to doing this is political, in countries where politicians like to blame problems on anybody but themselves. The current XO-1 has a minimum power draw in book reader mode, with the screen backlight off, of 0.5 watt. The maximum is about 8W, computing flat out with the screen at maximum. The XO-3 will draw even less power. Projected cost is $75. There are several NGOs working on solar power systems for school rooftops. We need to get them together, and talk about funding for worldwide deployment. Similarly for Internet. Nepal and Uruguay have developed teacher training programs for their laptop deployments. The experience in Ethiopia with a commercial training system is that teachers are ready to convert from total rote teaching, no questions permitted, to exploration on the Net with public questions and answers in about three months, given adequate support. The next question is how to train local trainers. The advantage to a tablet is that you can use it when you are not sitting at a desk. I think that the first thing to realize is that tablets are not replacing desktops for work as people prefer to type and have a larger screen when they have a chance to sit. A laptop requires you to sit and use two hands to input data. This would not be a good device for a delivery person, a doctor checking on patients or many other jobs that require someone to be moving around. All things given the same, a tablet will have added costs if it is touch screen. eBook readers typically don't have touch screens and the displays they use are usually monochrome. Therefore the cost of a reader will be less expensive than a touch screen tablet. From a cost standpoint, the ebook reader is the least expensive device, then the NetBook followed by the touch screen tablet. Some tablets are very expensive but these often use 7 inch screens, 2 and 3 hour batteries and slower processors. These lower cost tablets can be used as ebook reader substitutes but own't provide the very long battery life provided by an ebook reader. Ebook readers can be easily justified if reduces the purchase price of buying text books and if it can provide the student with better access to books. However, many of these eBook readers are tied to a specific service. An ebook reader that would require schools to buy their books through a specific service might not be such a good investment. There are reasons to buy ebook readers, tablets and netbooks but the decision shouldn't be based on one format being the best choice in all situations. I personally believe that in a classroom environment or in a home environment, the netbook or laptop will give the students more versatility, better screens and easier input than a tablet will. An ebook reader provides a viable alternative to paper books and a lower cost tablet can be used as an ebook reader substitute. Martin, thanks for Kenyan info. I have just sent an e-mail to KIE about the new Sugar Labs project, Replacing Textbooks. A vision of one iPad per teacher and student is never likely to be realised, an ideal that will never be reached due to the many and complex factors that make each one of our cultures, locations, education systems and schools unique. We all like to share each others experiences and then form our own judgements based on these and factors such as funding, infrastructure etc that exists in our own contexts. And so the ‘revolution’ unfolds at different levels. In Victoria, Australia we have iPad trials in ten schools, Maine, USA is buying the iPad 2 for all elementary students, Cedars school of excellence in Scotland has 1 to 1 iPads across the entire school. No-one explains better the impact of the iPad than Fraser Speirs from Cedars in his blog post of January 2010 ” Future shock” In junior / middle years, with an iPad, the focus is back on learning and off operating systems and computer glitches. They simplify the interaction between human and device, it is far more seamless. It eclipses eBook readers as it performs so many other functions as well. Now when it comes to what device, for who and at what age, in my context, further complications of politics and school councils and IT history / support and CPD time come into play. The smaller form factor iPod touch / iPhone etc is the truly mobile device, anywhere anytime. I can not over emphasise its value. The iPad will be a brilliant improvement / alternative to 1 to 1 netbook and laptop programs now and into the foreseeable future. But it is portable, not mobile. Adults and older students will also still need a notebook computer….or maybe both? Never is a long time but certainly is won't be with IPads as we currently see them. Personal computing devices yet to be designed and not exclusively from Apple. eg a cell phone that slots into different form factors such as a tablet, or netbook depending on how you want to use it and with a sub-$100 price tag. i-pads are no more "seamless" than a proficient user with a laptop. They are more mobile but limited for eg text input. Yes they have more function than ebook readers but they are also a lot more expensive. I don't see a tablet replacing my netbook until there is good keyboard support for the simple reason that like now, I enter quite a lot of text. Why would young children not need to enter text? Its like saying don't bother giving them pens or other than picture books. The current fragmentation looks to me too expensive and complex to manage so we are probably in a transition with i-pads just one stepping stone to getting to a position where technology generally replaces books, pens and pencils for most learning. But that is some way off because people take longer to change than technology and although interesting, the current technologies still don't hack it yet on cost-benefit. I am tired of the "typing is difficult" argument against iPads. I use an iPad to type proficiently. There are a few minor issues with the on-screen keyboard when typing quickly (some key 'touches' can be missed…). As for the 'seamlessness' of touch-screen devices, there is far less interface between your body/thoughts and results. It is a far more concrete experience, as compared with conceptualising what a trackpad/mouse/keystroke might achieve. Yes, you are a right – a proficient laptop user doesn't face issues with this: nor did the proficient electric typewriter user, or manual typewriter user… You, yourself are the embodiment of this – you are looking at how a new technology can transfer what you used to do to another form. Tablet computers are not about doing all the old stuff in a new way. They are about transformation. Why should five year olds be required to create copious amounts of written text? Because we have always done it? Why not let them create oral texts, visual texts, written texts – AND combinations of any of these they choose? You can't do that with a pencil… nor can you do that, simply, with a netbook/laptop. Cost IS an issue, though. I agree with you on that. The price of an iPad needs to drop significantly for it to be a viable option. Here in Australia, the government is subsidising student needs for education to the tune of 50%. iPods do not qualify (so the iPod touch, despite being a highly useful educational tool, can't be subsidised), but I know of plenty of people who have received this subsidy for iPads. It turns a $600 tool into a $300 tool. Well worth the money, I believe. Netbooks also qualify, so it makes them cheaper, too. All in all, the debate shouldn't be about replacing devices. It should be about how technology CHANGES education, and what the rapid rate of change of the devices students choose to use can do for education TOMORROW, not yesterday. Portables and handheld devices are revolutionizing the world and the education sector is no exception. At a time when slates and chalk revolutionized the world of education especially children education, every child (irrespective of how many are there in given home e.g. Nigeria) had one. Can same be said of smartphones, eBook readers or iPad? The answer is obviously No. Kindle or eBook readers may be cheap in the United Kingdom, but the currency difference and exchange rate would make it expensive in Nigeria and other developing nations. What makes the slates and chalk of last century cheap (to afford) was due to local production ability. Without local production or assistance from rich/develop nation to help the poorer nations, digital divide will not disappear nor close in. There is digital divide between nations as well as within a nation. In every nation there are the 'haves' as well as the 'have nots', but where the 'have nots' are larger in terms of population to the 'haves' the affordance of technology for learning would be low, and that brings a drag in the dream of compulsory/basic education for all if not a life long career. School Principals will be the ones that can affect this change of tablet technology being common place in schools – most school leaders currently unfortunately do not subscribe to it with genuine integrity. There still appears to be marketing competitions between schools to show prospective parents that we are a 'laptop school' and give token attention to handheld devices. Community perception can be a critical driver in a school rolling out 1000 laptops rather than more dynamic and flexible devices. In much of aus schools it still appears to be safe incremental change- surprisingly there are still lots of schools that see when purchasing devices -most should be desktops, next latpops and a few handheld devices!! For most of thse schools they are perpetuating acquisition of a 'safe marketable' device (desktop) which has been hanging around schools for 30 yrs!! Unfortunately I hate to say it but maybe Tablets/mobile devices being the standard device across MOST schools will only happen with the next generation of leaders?? in followup from my last post re we may have to wait for generational change of our school leaders – Quote from article below by Chris Kennedy and link below refers to why if left unchecked some of this change we are wanting and predicting in other sectors of the community may not happen in education and therfore kids will miss out??? And of course the motivated developing world will not have the same entrenchment into current and past systems so it could be that developing countries education systems leapfrog over ours. Interesting times ahead. "Interesting calculation. Does the $25 bn annually cover anything beyond the $75 tablet for each student? To equate the provision of an eReader or equipped tablet with the provision of "an education" seems a rather long and dangerous extrapolation." Computer with Sugar education software, renewable electricity in the school, Internet connection, OERs (including all necessary teacher training materials) in all needed languages, using the schools and teachers currently in place, and microfinance to create new businesses and thus new jobs using the new IT and other skills of the students. My plan does not cover building more schools and hiring more teachers, which are functions of the responsible governments, aid agencies, and NGOs, and for which I do not have good numbers. However, if we were to put this plan into action, I would ask UNESCO and other agencies, and the countries themselves, to provide estimates of all of these other costs, and how much governments can afford on their own. We would then consider how to fund education in countries that presently cannot afford schools, teachers, or adequate textbooks even in the (foreign) language of instruction, much less in the languages that the students actually speak. OERs can satisfy the third requirement. Keep in mind, however, that this $25 billion annual outlay is not a net expense, or even a net investment. It is offset by the cost of printed textbooks that will no longer be needed. I estimate that our part of educating a billion children thus requires a net negative global investment, and thus has an infinite Return On Investment. The net cost would be very negative in developed countries, and still beyond the means of the poorest countries until the new graduates with the new jobs start paying enough taxes to cover the next cohort of students.